HOME PRODUCTS &AMP; SERVICES DIRECTORY OF SUPPLIERS LIGHTWAVE LINK, INC.
Lightwave Link Inc. was founded in July 1996 and is located in the Hsinchu Science-Based Industrial Park in Taiwan. Their main products and areas of research and manufacturing are optical passive communication components. Lightwave Link specializes in optical switches from R & D, to product design and brand marketing. They have registered patents in Europe, America, Japan, Taiwan, and all around the world. They work with internationally renowned major clients such as Tellabs and more! 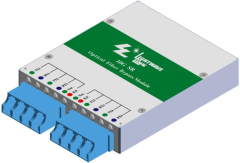 With 14 years of experience in optical communications, in addition to their high quality products, Lightwave Link also provides services for solving communication network performance problems such as: accelerate communication throughput, continuously minimize dimensions, low insertion loss, and high switching times. Lightwave Link Inc. is committed to establishing partnerships with globally renowned partners in the pursuit of multi-business opportunities. Lightwave Link continuously researches and develops in order to maintain their market leadership and continue to provide customers with high quality products and technical resources. View More Product Announcements from Lightwave Link, Inc.